Kappan: Your professional experience has been extraordinarily varied. You’ve taught at the elementary, secondary, and university levels in multiple countries. You’ve worked in adult education, children’s television, online learning, counseling, and higher education administration. You’ve done research on multilingualism . . . How have your many roles and interests brought you to focus specifically on brain science and its implications for teaching and learning? Tracey Tokuhama-Espinosa: I trace everything back to my dad, who was a great, great teacher. He was raised in Hawaii and went to UC Berkeley in the 1960s on a scholarship to study nuclear physics, but he decided what he really wanted to be was a public school math teacher. He worked in some pretty tough neighborhoods in Northern California, and he always chose to teach the students who were struggling the most. He started something called the “F Club,” for example, for kids who had failed classes, so he could get them together and find a way to get back on track. I remember walking down the street with him, and these big, burly guys would always come running over to say hi and tell him that they have a great job now, and they’re doing well, and they wouldn’t have made it without him . . . So I knew my dad was a brilliant teacher. But I always wondered what was it, exactly, that made him so good at it. Was he just really smart about math? Did he have some mysterious knack for connecting with kids? What was it? So that’s what drew me into education, this curiosity to figure out what makes somebody a great teacher, and why it is that some kids learn things easily but others struggle. Over time, that led me to neuroscience, which focuses on the organ that’s most important to teaching and learning: the brain. And, in turn, I realized that while recent findings from brain science can be incredibly helpful to educators, those findings haven’t really been incorporated into teacher preparation. 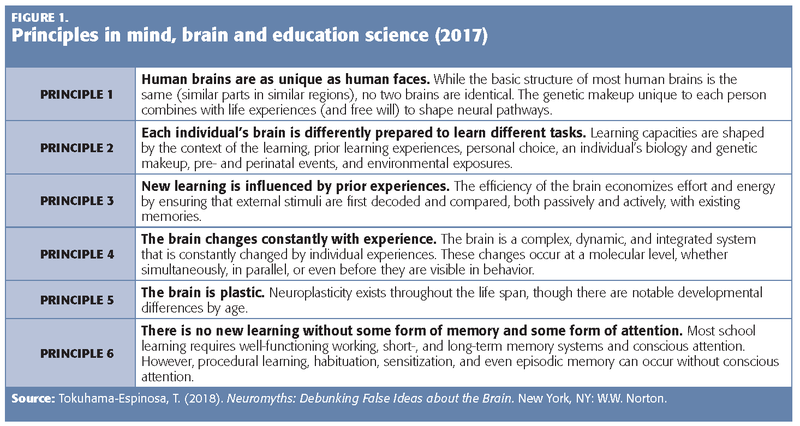 Perhaps even more important, teachers have picked up a lot of misinformation about the human brain — “neuromyths” is the term I like to use — and these mistaken beliefs about how the brain works can easily lead them to teach in ways that are harmful to kids. But let me say up front that I’m not trying to blame teachers for what they don’t know. A lot of the science is new, and teachers haven’t had enough opportunities to learn about it and see for themselves why it’s time to reconsider certain ideas. Kappan: In your new book, you describe working with researchers from around the world to identify these neuromyths, figure out where they come from, and explain why they’re not true. Tell us a bit about that work. Tokuhama-Espinosa: In 2002, the Organization for Economic Cooperation and Development (OECD), which is based in Paris, did an international comparative study showing how teachers around the world just didn’t know enough about the brain. So, in 2007, while I was working on my doctoral dissertation, I decided to bring together a group of experts in neuroscience, psychology, and education — called the Delphi panel — to look into ways to improve teachers’ pedagogical knowledge. In particular, how should teachers’ work be informed by recent advances in neuroscience? The Delphi panel is sort of like the panels that have been convened in the U.S. by the National Academy of Sciences (NAS) — and, in fact, some of the members of the Delphi panel have been on NAS panels, too — but Delphi is more international. Basically, the idea is to convene a diverse group of researchers who are experts in their field to see if they can reach a consensus on what’s known, at this point, about the science of learning. Given the existing evidence, what can we say for sure, and what can we say we with less certainty? In 2017, I conducted a 10-year follow-up to the Delphi study, and around the same time I was asked by the OECD to be a part of an expert panel to clarify what should be teachers’ new knowledge based on all of these findings. In both projects, I heard a lot of agreement about important advancements in the study of teaching and learning, but I also heard experts voice this frustration: Why do teachers still believe all these old myths about the brain, like the idea that we use only 10% of our brain power, or that some people are “right-brained” and others are “left-brained,” or that listening to classical music will make you smarter? For years we’ve been collecting and sharing the real findings, so why do teachers continue to believe things that aren’t true? If we want teachers to understand how students actually learn, we’re going to have to start by clearing away these mistaken beliefs. Many of us came to the conclusion that if we want teachers to understand how students actually learn, we’re going to have to start by clearing away these mistaken beliefs. So that’s when I decided to write this new book on neuromyths. Kappan: Give us a few more examples. Obviously, we can’t review all 70 of the neuromyths that you describe in the book, but what are a few of the most prevalent myths that teachers tend to believe, and what makes them so harmful? Tokuhama-Espinosa: There’s the idea that students have differing “learning styles,” which has been debunked many times. Or the idea that male and female brains are fundamentally different from one another. Or the idea (popularized by some of the early brain research) that specific abilities are locked into specific parts of the brain — spatial ability in one part, reading in another, math in another, and so on. Or take multitasking. A lot of people, including a lot of teachers, think they’re good at it — and a lot of people insist that women are better at it than men! But the fact is that nobody can multitask, not if we’re talking about tasks that put a significant cognitive load on your attention and memory. Sure, if you’re talking on the phone with your mom, you might be able to chop vegetables at the same time. But chopping vegetables doesn’t require much mental energy. It’s a routine activity you’ve habituated over time. You’ve more or less automated this particular skill, so you can do it while telling your mom about your day. But you can’t tell your mom about your day while you’re also trying to read a recipe. It’s inefficient. You get distracted. At best, you can shift back and forth between those two tasks. My own kids tell me they like to listen to music while they do their homework. It’s relaxing, they say, and it doesn’t take up any of their working memory. And they’re right, as long as they just have the music on in the background. But as soon as they start checking their text messages, they’re no longer doing their homework. They might argue that they have this special capacity to multitask, but it’s just not happening. And the same goes for teachers. They might think they can go over Johnny’s homework while they’re also listening to Mary explain why she was late to class, but they can’t really do both things at once and pay the necessary attention. Kappan: You mentioned the widespread belief that male and female brains are different. Is that just old-fashioned sexism, or is there a specific origin to that idea? Tokuhama-Espinosa: Both. And this is one area where it’s hard to separate the bias from the science itself. You can go back to the 1800s, for example, when scientists discovered that men tend to have slightly larger brains than women, which — since bigger is assumed to be better — they took to mean that men have more brain power. Of course, it didn’t occur to them that if men’s and women’s brains differ in size, that’s just because men’s and women’s bodies tend to differ in size overall. And in any case, we’ve come to understand since then that our human potential to learn doesn’t have to do with brain size or the total number of neurons — learning has to do with the connections we create among neurons. Now I’m not saying that there aren’t any differences to be found between male and female brains (or the amounts of hormones males and females tend to produce, which do influence behavior). For example, there was a brain imaging study that observed that when doing certain types of spatial reasoning and math problems, boys and girls activated different neural networks. But there’s no evidence that this translates to differences in intelligence or potential. It’s not that girls can’t reason spatially just as well as boys; they just use a different network to get the same solution — and with a tiny bit of training, they perform at the same level. So yes, you can point to some very small differences between male and female brains. What’s so important to remember, though, is that the differences among men, and the differences among women, are far greater than the differences between men and women. Kappan: Is that how neuromyths get started? Scientists observe a small difference, or they report a single finding, and people blow it out of proportion? Tokuhama-Espinosa: Right, a little bit of scientific knowledge can be a dangerous thing. We just haven’t done very much to help teachers become scientifically literate. So when the popular media (who love simple Mars-Venus kinds of stories) report that a new brain imaging study shows that boys and girls use different neural networks to solve math problems, how are teachers supposed to know that, in reality, this isn’t such an important finding? One danger is that teachers will see the news report as confirmation of their existing assumptions about male-female differences. Unconsciously, at least, it will shape how they treat boys and girls in the classroom, or how they interpret boys’ and girls’ performance. So if Anna’s having trouble with math, then on some level the teacher will assume it’s because Anna’s a girl — because, after all, didn’t they say on the news that girls aren’t as good as boys at spatial reasoning? And another danger is that there’s a lot of commercial benefit to be had by playing up these differences and exploiting people’s misunderstandings about the significance of individual scientific studies. Actually, this is an issue that I wish I could have addressed more in my book, but my editors urged me not to because they were worried that if I went after some of the commercial programs, we’d face lawsuits. But you can probably guess some of the companies that I’m talking about. You see their ads all the time on TV, all these toys, devices, pills, and software that are supposed to boost your kids’ memory or make them smarter. Tokuhama-Espinosa: True, so let me say this bluntly: It’s always good to be skeptical about commercial products based on brain research. Don’t be fooled by how many scientists a company has on its advisory board, or what they’ve been able to teach rats in the lab, or even what they’ve been able to teach some kids under controlled conditions. It’s just not that straightforward to turn research findings into effective programs and apps. If it sounds too good to be true, it probably is. It’s always good to be skeptical about commercial products based on brain research. That’s why it was so exciting to work with the Delphi panel, where the whole idea was to bring all of these super-skeptical scientists together to set the advertising aside, look very carefully at the existing evidence, and say “OK, this approach has our blessing . . . and that idea truly is worthy of bringing into classrooms.” It’s very cool for a group like that to be able to reach consensus on some specific principles that teachers can really stand behind. Kappan: Isn’t that what the U.S. Department of Education’s What Works Clearinghouse is supposed to do? Doesn’t it try to be something like a Consumer Reports for K-12 education? Tokuhama-Espinosa: Yes and no. On the Delphi panel, we looked at the What Works Clearinghouse, but we found that its goal is much narrower than what we were trying to do. 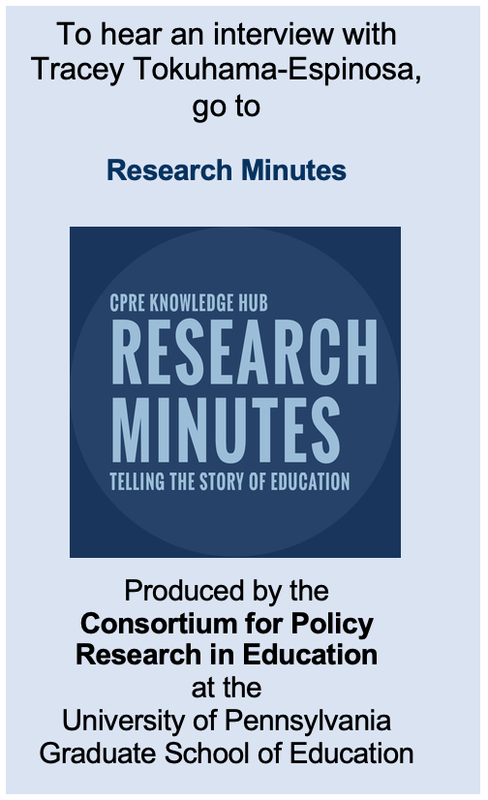 Mostly, the clearinghouse evaluates specific educational programs and interventions, but we set out to take stock of the underlying knowledge base, from across the learning sciences. We didn’t ask whether this or that intervention works in the classroom. 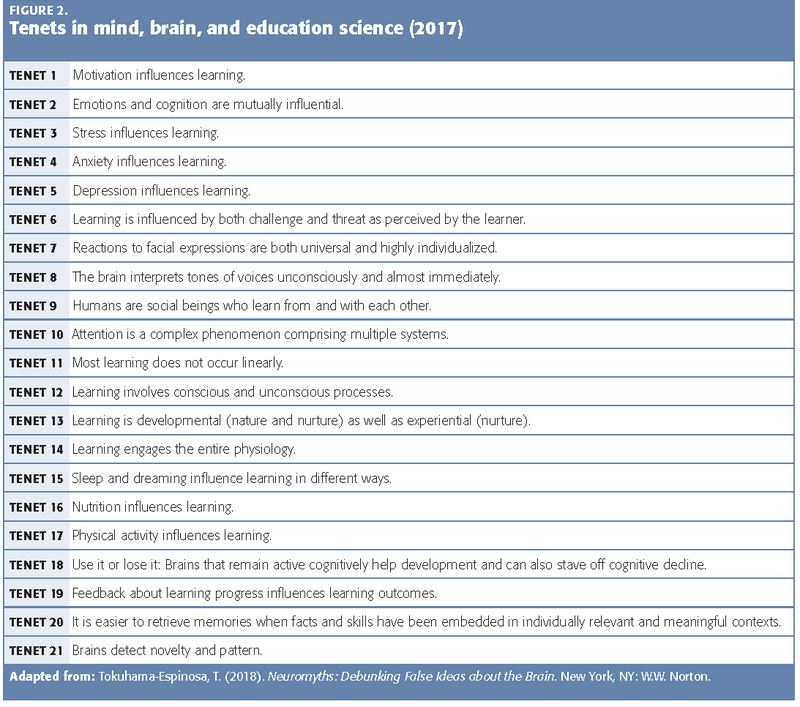 Rather, we asked, what does neuroscience tell us about teaching and learning? For example, we reviewed the research on sleep patterns and how they relate to memory and learning, and we looked at the research on nutrition and stress and depression and their effects on learning . . . These topics aren’t going to show up in the What Works Clearinghouse, but they are critically important for educators to understand. Kappan: In your book, you explain that the 2017 panel was able to reach agreement on six core principles (see Figure 1). These are findings, drawn from a mountain of research in the neurosciences, that panelists found to be true about how all brains work, regardless of context or culture. Further, you identified an additional 21 tenets (see Figure 2). These are also supported by very strong evidence, but the panelists couldn’t reach quite the same level of consensus on them — some argued that these may not be universally true; they may vary somewhat by individuals and across contexts and cultures. The question is, if we know these principles and tenets to be true, then so what? What are the implications for K-12 education? Tokuhama-Espinosa: Let’s start with the first principle, which states that while all brains share some basic similarities in structure, all brains are also unique. Every person begins with their own, unique genetic makeup, and they also have their own life experiences, which influence the neural pathways they create in their brains. Kappan: In other words, we’re shaped by a combination of nature and nurture? Tokuhama-Espinosa: Yes. And free will. And that’s good news, since it means we’re not totally constrained by our genetics or past experiences, but also our choices. But at the same time, there’s also sad news here: Free will has its limits. It’s just not true that we can rewire our brains to become whoever we want. The My Fair Lady story has to go out the window. If the kids in my class have had totally different life experiences — some of them super-enriched and others super-constrained — then it’s not realistic to think that I can get them all to the same place in the same amount of time with the same activities. Kappan: I’m assuming, then, that you disagree with Malcolm Gladwell’s argument that anybody can become successful at anything if they put 10,000 hours of practice into it. Tokuhama-Espinosa: Well, most people can get to be pretty good at certain things, especially things that involve motor learning, like playing the piano. Your brain adapts to what it does most, so if you spend a lot of time rehearsing a skill, you’re going to improve. Again, that’s the good news: We can help every kid to make real progress in school and life. But there’s a limit. If you have a Tiger Mom who makes you spend 10,000 hours practicing the piano, then you’re probably going to reach a pretty high level of proficiency. But if it’s not in your nature to become a truly great pianist, then you won’t be a gifted musician, no matter how many hours you put into it. Not everybody has the potential to be a genius. Kappan: How would you integrate these principles and tenets into teacher preparation? And if all teachers understood these things, what difference would that make? Tokuhama-Espinosa: Experienced teachers know all sorts of things — either intuitively or from reading and professional development — about what works and what doesn’t. They probably know, for instance, that it’s important, early in a lesson, to elicit students’ background knowledge about a topic. But the question is, why is it so valuable to assess prior knowledge? Why should you provide explicit instruction in metacognitive strategies, getting students to think about their own learning? Why is it so important to ask kids how they figured out a math problem? This is the added value that teachers get when you introduce them to the neuroscience. They don’t just learn that a teaching practice has evidence behind it; they learn why it tends to be effective. And that puts them in a better position to figure out what’s working and what’s not in their own classroom. If you understand how important motivation is to learning, say, then you’ll be more aware of the need to assess students’ motivation, or to figure out why one kid doesn’t seem to be motivated by something that’s working for everybody else in the class. Or, for example, if you understand that the human brain interprets a speaker’s facial expressions and tone of voice much faster than the words they’re saying, then you’ll be more careful about your own classroom demeanor. I think this is the best way to empower teachers. If they know the science, then that allows them to be better researchers in the classroom. I think this is the best way to empower teachers. If they know the science, then that allows them to be better researchers in the classroom. And, you know, teachers do more experiments in a day than a neuroscientist does in a lifetime. They may not document it or present it at conferences, but they are always experimenting, constantly asking themselves, What do I plan to do? What did I actually do? Did it work? Why or why not? And the science gives them the background knowledge they need to make those judgments. Kappan: It sounds like you’re saying that an understanding of neuroscience will help strengthen teacher professionalism. Tokuhama-Espinosa: Absolutely. And that’s what we hoped to find on the Delphi panel: The goal was, in part, to review the science and identify the strongest research findings from the learning sciences, but the real find was the usable knowledge — how to redesign teacher preparation and development to give teachers a really solid grounding in the science, beginning with the basics and then becoming more sophisticated over the course of one’s career. We agreed, first off, that when working with novice teachers, the most important thing is to clear away all of these mistaken beliefs about the brain and how people learn. And by the way, that’s really hard to do. There’s a whole sub-field called “cognitive ontology,” which studies the ways people come to see and think about the world, and what it takes to change one’s mind. It turns out that even if people are confronted with strong evidence that their ideas are wrong, they tend to hold onto those ideas very tightly. For instance, if you grew up being told by your teachers that you have a learning style — you’re a “visual thinker,” say — and all of a sudden I come along with all of this evidence showing that there’s no such thing as learning styles, you’ll probably resist that evidence. You’ve always thought of yourself as a visual thinker. It’s your identity. So no matter how persuasive the science may be, you’ll struggle to accept it. It’s much, much harder to unlearn and relearn than to teach you something totally new. So it’s absolutely critical for novice teachers to start out by getting rid of mistaken preconceptions about how kids learn. Otherwise, they won’t be receptive to what the science actually says about learning. Second, the panel agreed that at the beginning of their careers, teachers ought to learn what the science has to say about planning for instruction. For example, there’s strong evidence that students remember information better if it is presented at spaced intervals — it’s more effective to study something for an hour each day for five days than to study for a single five-hour block of time. So, new teachers ought to learn some basics about memory and attention, so they can understand why this kind of scheduling makes sense. In all, we’ve identified more than 220 specific research findings and skills that teachers might be expected to learn over time, in order to become truly expert in the profession. And we laid them out in a hierarchy of skill sets, which could serve as a road map for professional advancement. So as a beginning teacher, I should know about these neuromyths and understand why some of my preconceptions about learning are wrong. I should also know the basic principles of how brains work (as agreed upon by leading scientists from a range of disciplines). And I should know certain things about effective ways to organize classrooms, plan lessons, and use technology. Then, a few years into my career, I might be expected to know the science a little more deeply — for example, to know the details of how stress and depression and poor nutrition can influence student learning. And over the years, my knowledge about the science of learning will deepen to the point where I meet specific standards that we ought to expect of a master teacher. The idea is to try to create a clearer path for professional development over a 30-year career, where your status depends not just on years served, and not just on demonstrated skill in the classroom, but also on your concrete understanding of the scientific evidence about teaching and learning. To create a profession, you need to be able to show that you’re grounded in a valid, reliable body of knowledge. And given the gains that neuroscience has made in recent decades, it is ready to provide that sort of professional anchor. Citation: Heller, R. (2018). What we know (and think we know) about the learning brain: An interview with Tracey Tokuhama-Espinosa. Phi Delta Kappan, 100 (4), 24-30.